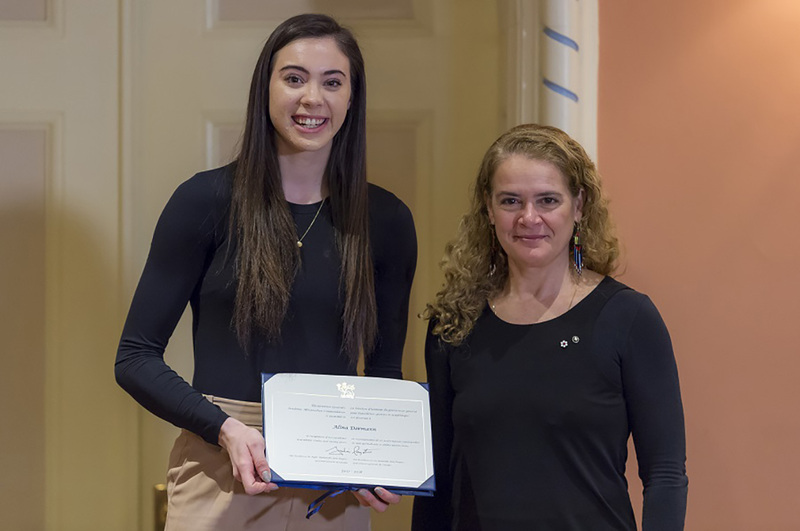 The University of Toronto’s Alina Dormann, a fourth-year Varsity Blues volleyball player, was honoured at Rideau Hall today as part of an elite group of Canadian university athletes who received the Governer General’s Academic All-Canadian Commendation. Dormann was selected by the university sports governing body U Sports as one of Top 8 Academic All-Canadians for the 2017-18 season. In order to achieve academic all-Canadian status, athletes must maintain an average of 80 per cent or better over the academic year while competing for one or more of their university’s varsity teams. In her welcome address, Governor General Julie Payette said the student athletes are superstars who combine physical activity and intellectual activity every day with exceptional results, much like astronauts. “You represent the superstars right here on Earth and we are so happy to have a chance to honour you,” she said. “Playing on the Varsity Blues women’s volleyball team has been the most incredible part of my university experience,” said Dormann. “The opportunity to compete in a sport that I love with my best friends is so special and I am truly thankful for the opportunity to represent the University of Toronto in this way. Describing volleyball as the ultimate team sport, Dormann said that every opportunity she gets to score a point is because of the hard work and outstanding effort of her teammates. “There are so many people whose names should be listed on this award, as every time I step on the court I have the support of my teammates, coaches and the Varsity Blues community. This award is truly a representation of each and every person who is a part of the Varsity Blues volleyball program,” she said. Dormann becomes the 10th Varsity Blues athlete, and the seventh in the past nine years, to earn the recognition since its inception about 25 years ago. She entered the 2017-18 intercollegiate season after spending the summer with the Canadian senior women's national team. She represented Canada at the 2017 FISU Summer Universiade in Taipei and went on to have another dominant season for the Blues on the court. The Ottawa native led Ontario University Athletics (OUA) with 3.66 kills per set – good for seventh in the nation – and ranked second in the province and fourth nationally with 4.6 points per set through 18 matches. She also topped Toronto in total attacks and serving aces, while ranking second in digs per set and third in blocks per set. Dormann was named the OUA East player of the year for the third consecutive season, while also earning her third career U Sports all-Canadian nod. Dormann led U of T to a 15-4 regular season record and notched a season-high 27.5 points as Toronto topped the Guelph Gryphons, 3-2, to advance to their seventh straight OUA final four. More impressive, Dormann achieved all of this while pursuing a double major in biology, and health and disease. The Victoria College student has won several academic awards. Drakich was in Ottawa for the award ceremony, joining Dormann’s parents and Professor Ira Jacobs, dean of the Faculty of Kinesiology & Physical Education. In addition to her excellence on the court and in the classroom, Dormann makes time to give back to the volleyball community. She volunteered as an assistant coach with the Ontario Volleyball Association during the 2018 Ontario Summer Games and served an assistant coach at Volleyball Position Camp, which trains players in their chosen position. Dormann also coaches recreational house league and competitive beach and skills clinics with the Leaside Volleyball Club in Toronto.